Last week Apple finally refreshed its MacBook Pro line of laptops, after many years. And while the company mostly talked about the Touch Bar at the event, the entry-level 13-inch MacBook Pro doesn't have that, or Touch ID fingerprint recognition. This cheapest (if you can even use that word for a device that starts at $1,499) model has been torn down by iFixit today, revealing its insides. The laptop in question has the model number A1708, and an extra-long Escape key for whatever reason. To get to the internals, you first need to unscrew six pentalobe screws, which is a smaller number compared to past MacBook Pros. 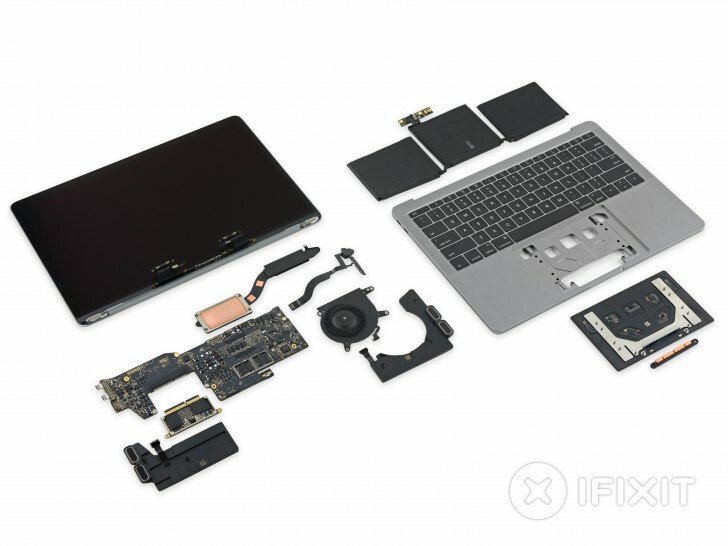 The trackpad is easily removed, and it comes with a Broadcom controller and an electromagnet for Force Touch features. The battery is a 54.5 Wh unit, around 27% smaller than the one in last year's 13-inch MacBook Pro. That said, the battery in this model is bigger than the 49.2 Wh one in the new 13" MacBook Pro with the Touch Bar. The SSD can be replaced, and this 256GB unit has SanDisk NAND flash memory and an Apple-made controller. The form factor and pin configuration are new. The laptop's LPDDR3 RAM is supplied by SK Hynix. The 3.5mm headset jack is a single modular unit which can easily be replaced in future models with a Lightning or USB Type-C connector. In the end, the 2016 13-inch MacBook Pro with function keys got a 2 out of 10 repairability score (10 being easiest to repair). The only positive aspect is the fact that the trackpad can be removed without first having to take the battery out. There are plenty of downsides to the laptop's design when talking about repairability, however. The screws are still proprietary (pentalobe), the battery assembly is entirely glued to the case, and very solidly so, while the RAM is soldered to the logic board. This means there's no way to upgrade memory. Finally, the proprietary SSD isn't a standard drive, even if it is replaceable. well, phones are cheaper than laptops. you can just buy a new phone if the phone broke, just I don't like you logic. With that price I can custom buy a Gaming/Business/Entertainment Laptop that is 3/4x more powerful. Also able to install different OS from Windows, Mac(Hackintosh), Linux(Any Distros), Android x86, etc. even multi-boot them all together.